What Else Can I Expect from an Online Substance Abuse Counseling Program? Substance abuse and behavioral disorder counselors, also called addiction counselors, support clients struggling with alcoholism, drug abuse, gambling, and other addictions. The Bureau of Labor Statistics (BLS) reports that all 50 states require full licensure for counselors in private practice, including substance abuse and behavioral disorder specialists. The requirements for substance abuse counselors outside of private practice vary by state. Some states require a college degree and/or a passing score on an addiction counselor certification or licensing exam. An online substance abuse counseling degree helps students develop the foundational knowledge and skills needed to enter the workforce. The best online programs also prepare prospective counselors to tackle the licensure requirements in their state, including the licensing exam. The web-based format is ideal for students who must balance schoolwork with other commitments, such as employment or childcare. Learn about what to expect and what you can do with a bachelor’s degree in addiction counseling online with this comprehensive guide. Will an Online Substance Abuse Counseling Program Provide Me With the Skills I Need to Advance My Career? A bachelor’s degree is the first step toward a successful career in substance abuse and behavioral disorder counseling. Students learn about the psychological impulses behind addiction, as well as different techniques for administering client therapy. Most colleges and universities tailor online bachelor’s programs to state licensure requirements, and many programs include internships to help students meet state clinical requirements. According to the BLS, state clinical requirements range between 2,000 and 4,000 supervised hours. Will an Online Substance Abuse Counseling Program Work With My Schedule? Online bachelor’s programs offer a flexible alternative to traditional, on-campus education. Most programs offer asynchronous coursework, allowing students to submit assignments and take exams at their convenience. Technology also enables students to study anywhere that has Wi-Fi capabilities. Substance abuse counseling programs usually allow online students to coordinate clinical internships and practicum courses at sites near their residence. What Jobs Can I Get With My Substance Abuse Counseling Degree? Graduates with a bachelor’s degree in substance abuse counseling and a state-issued license can provide services in private practice. These candidates are also prepared for positions in outpatient centers, addiction rehabilitation facilities, and other healthcare establishments. Many substance abuse and behavioral disorder counselors eventually pursue a master’s degree to expand employment opportunities. What are the Best Online Substance Abuse Counseling Programs? Below, we ranked the top bachelor’s in substance abuse counseling programs in the country. 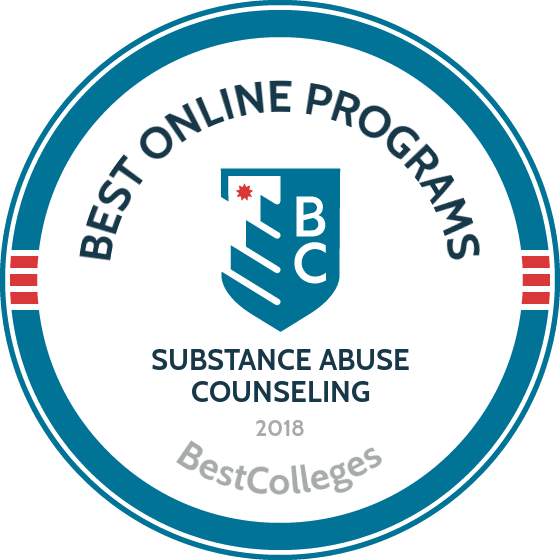 If you are considering an online bachelor’s in substance abuse counseling, be sure to review these top schools. Based in the eponymous city of Cincinnati, Ohio, UC enrolls nearly 46,000 students. During its opening in the 19th century, the university initially drew ire for its liberal arts curriculum, which upset farmers and industrialists in the surrounding area. Since then, the school has continuously expanded its disciplinary offerings, adding various preprofessional programs to its existing liberal arts degrees. In the past decade, UC expanded its distance learning presence and now offers a substance abuse counselor degree online. The 24-credit program at UC awards a certificate, covering foundational substance abuse topics. The curriculum approaches the subject matter through the lenses of medicine, pharmacology, biology, psychology, sociology, and psychiatry. Students also study preventative measures to proactively combat addiction before it starts and learn how to recognize, understand, diagnose, and treat substance abuse. Students typically complete the program within nine months. Graduates often go on to pursue careers as psychiatrists, licensed professional counselors, or probation officers. As many of the students in the program work or raise a family full time, UC offers flexibility by delivering the program's coursework asynchronously and eliminating all in-person and on-campus requirements. The program offers open admission to any student with a high school diploma or GED and does not require a minimum GPA or standardized test scores. Based out of Iola, Kansas with a satellite campus in Burlingame, Kansas, Allen Community College historically awarded associate degrees to students in the surrounding region. In recent years, the college expanded its distance learning offerings and now reaches students across the nation. Allen also offers one of the strongest substance abuse counselor degree programs online. The program requires students to complete 33 credits, which takes two semesters. During their first semester in the program, students take courses such as medical high risk issues in addiction and prevention, introduction to group counseling, and multicultural aspects of counseling. The second semester focuses on treatment, as all students complete a practicum experience at an arranged site in their local community. Students never need to visit campus in Iola to complete the degree, and the program provides additional flexibility by delivering all of its coursework asynchronously. After graduating from Allen with the certificate, students can smoothly transfer into a four-year substance abuse program thanks to articulation agreements with various four-year universities in Kansas and the Midwest. Students who want to earn certification from the Kansas Association of Addiction Professionals must complete the program and hold a bachelor's degree in a relevant field. Serving the titular Mohave County, Arizona by operating campuses in Colorado City, Bullhead City, Lake Havasu City, and Kingman, MCC opened in 1970 with the goal of educating the local population. Since then, MCC has evolved and now offers several of its associate programs through distance learning, including an online addiction counseling degree, allowing the college to provide education to students all across the nation. The associate of arts in substance abuse counseling program at MCC requires students to earn 62 credits. Like most associate degrees, the curriculum combines general education coursework with major-specific coursework in areas such as case management, professional ethics, and the psychological and biological factors that cause addiction. Common careers for program graduates include substance abuse counseling, mental health counseling, human service assistance, social work, and health education. As a community college, MCC provides open enrollment. Prospective students need only submit evidence of a high school diploma or a GED to apply, and the school does not list any minimum GPA or standardized test score thresholds. Aiming for flexibility and accessibility, the substance abuse counseling program at MCC delivers all of its coursework asynchronously and eliminates all in-person and on-campus requirements. The program runs on a self-paced, competency-based model that enables students to progress quickly through coursework provided they demonstrate 80% competency. Based out of Tempe, Arizona, Rio Salado College opened its doors in the late 1970s and now operates more than 15 campuses and satellite locations in the area. RSC is one of 10 Maricopa Community Colleges, which offered evening and continuing education courses at nearly 200 different locations through the Phoenix area. Recently, the district converted many of those evening programs into distance learning programs. Following that trend, RSC began offering online programs in 1996 and now offers the majority of its programs through distance learning. RSC delivers its substance abuse counselor degree online and without any in-person or on-campus requirements. Students can choose between an associate of applied science degree and two levels of completion certificates in addictions and substance use disorders. The associate degree requires students to earn approximately 64 credits, a process that usually takes two years. Notable courses include courses in co-occurring disorders, group interventions, adult children of alcoholics, and legal aspects of alcoholics. RSC delivers all of the program's coursework asynchronously, enabling students to continue to work or raise their families full time. RSC and its substance abuse programs maintain a seal of approval from the National Association of Alcohol and Drug Abuse Counselors. The program does not list any minimum GPA or standardized test admission requirements, although all applicants must submit proof of a high school diploma or GED. Located in Maine's capital city of Augusta, UMA opened its doors in the 1960s as the result of a mandate from the state legislature for a continuing education branch of the University of Maine System. Originally, UMA offered many of its programs through evening classes. In modern times, the university continues to deliver continuing education programs to working professionals, using distance learning to access a larger population. As a result, the school now offers several of its strongest programs online, including an online addiction studies degree. The substance abuse rehabilitation technician certificate at UMA requires students to earn 30 credits. All students must complete at least half of those credits through UMA coursework, meaning that transfer students may bring up to 15 approved credits with them. The curriculum includes coursework in foundational substance abuse counseling areas, including case management, crisis intervention, chemical dependency counseling, and group process. Aiming to better fit the busy schedules of working professionals, the program delivers all of its coursework asynchronously and does not include any in-person or on-campus requirements. The substance abuse program at UMA does not list minimum GPA or standardized test requirements. Applicants need only submit evidence of a high school diploma or a GED. To better assist its distance learners, UMA provides all students in the program with access to academic advising and support services. Based out of the small town of Blue Bell, Pennsylvania, Montgomery County Community College, known as Montco to locals, also operates satellite campuses in nearby Lansdale and Pottstown. Locally, Montco earns the most recognition for specific preprofessional programs, including offerings in culinary arts and public safety. However, Montco also caters to a national student body by delivering several of its programs through distance learning, including a substance abuse counselor degree online. The addictions counseling certificate at Montco is designed to meet the needs of both beginner and experienced students. The 36-credit curriculum includes a single general education course in English composition and addiction-specific courses, such as the drug and alcohol treatment process, introduction to adjunctive therapies, and social policy and ethics in human services. Students also complete a practicum experience at an approved site in their local communities. Some courses require students to take placement tests before enrolling. Catering primarily to working professionals and parents, the addictions program at Montco delivers all coursework asynchronously and never requires students to visit campus to earn their degree. Students looking to ease the burden of tuition can seek funding at Montco, which awards approximately 500 scholarships each year. The program does not list any admission requirements (such as a minimum GPA or standardized test score threshold) beyond a GED or high school diploma. Located in Dryden, New York with additional satellite campuses in Ithaca and Cortland, Tompkins Cortland Community College holds membership in the State University of New York System. Originally opening its doors in the 1960s, the school completed a large campus construction project in the past decade, adding many new academic buildings and facilities. Nevertheless, students never need to visit the campus to earn a degree from Tompkins Cortland, which offers several programs through distance learning, including a substance abuse counselor degree online. Tompkins Cortland's program ultimately awards an associate of applied science degree in chemical dependency counseling. To earn the degree, all students must complete 62 credits, a process that typically requires four full-time semesters, or two years, of study. Noteworthy and relevant courses in the curriculum include abnormal psychology, counseling theories and interventions, principles of biology, and introduction to chemical dependency counseling. Students in the program also complete a two-part fieldwork experience that enables them to apply what they learned in the classroom to scenarios with actual patients and clients. The program delivers 80% of its coursework online and 20% of its coursework through in-person work. Students looking for an entirely online experience can enroll in Tompkins Cortland's 26-credit chemical dependency counseling certificate program instead. In both cases, Tompkins Cortland delivers all of the program's online coursework asynchronously. Based in the Green Mountain State's capital city of Montpelier, the Community College of Vermont operates 11 additional satellite campuses throughout the state. CCV first opened its doors in the 1970s, created its virtual campus in 1992, and offered its first ever online course (introduction to political science) in 1996. As such, CCV boasts a long tradition in online education and continues to excel in distance learning. CCV now offers a substance abuse counselor degree online. The 27-credit substance abuse services certificate curriculum includes noteworthy courses, such as human growth and development, introduction to case management, group process theory and practice, and co-occurring issues in substance abuse and mental health. Students also complete a field experience in a community setting or workplace as a capstone course. Most students enroll in the program to either launch a career as a substance abuse counselor or enhance a degree in criminal justice, social work, or human services. Striving for flexibility, CCV delivers all coursework in the program asynchronously and never requires students to visit campus in Montpelier. Online students at CCV also gain access to the school's bevy of career counseling and development resources, including career consultants and scheduled appointments with counselors. Indiana Wesleyan, an evangelical Christian university of the Wesleyan Church, is the biggest private college in Indiana and the largest member of the Council for Christian Colleges and Universities. The 350-acre campus in Marion is home to 3,000 students; an additional 10,000 adult learners attend classes at satellites in Indiana, Kentucky, Ohio, and in virtual classrooms. IWU offers more than 80 undergraduate degree programs, including a bachelors in substance abuse counseling online. IWU’s Bachelors of Science in addictions counseling explores substance abuse issues from a Christian perspective. The cohort-based degree is offered completely through the web, with a 350-hour, in-person practicum at an agreed-upon location. The curriculum delves into theory, physiology, pharmacology, personality types, dysfunctional families, and the best practices to deal with the growing problem of addiction. The degree can be earned in 22 months. Graduates meet the licensure requirements in most states. Five start dates are available for added flexibility. The school’s Off Campus Library Service is available to assist online learners. UC, one of the country’s leading research institutions, sits in Ohio’s third-largest city on a campus nationally recognized for its beauty. The school has a student population of 44,000. UC has a virtual campus where students can pursue more than 75 degrees and certificates, from the associate’s to the masters’ level. The bachelor’s in substance abuse counseling is offered by the university’s college of education, criminal justice and human services. The addiction counseling degree online prepares students to become practicing clinicians in the field of chemical dependency treatment and prevention. Students can choose to concentrate in several areas, like child abuse, or another human-service field. Classes are designed to simulate clinical settings. The Blackboard platform is used to deliver curriculum materials in an asynchronous format. Even though UC’s distance learners are commonly part-time, they complete their degrees at a rate comparable to full-time on-campus students. Graduates meet the coursework requirements for licensure in Ohio; other states may differ. UC provides an array of support services to distance students, including OhioLink Library Resources, exam proctoring, and tutoring. NSU, located in Natchitoches, was founded in 1884 as the state of Louisiana’s normal school. It’s a comprehensive public university with 9,000 students, the majority of whom are undergraduates. In addition to the main campus, the school has satellite facilities in Alexandria, Fort Polk, Shreveport, and online. NSU’s web arm, eNSU, has been offering web-based learning longer than any other college in the state and has the most options: 39 degree programs. These include a substance abuse counselor degree online. ENSU’s bachelor of science in psychology with a concentration in substance abuse is a 120-credit program that explores human behavior, addictive personalities, and modern advances in the field of substance abuse treatment. The curriculum features classes like family dynamics, pharmacology of addiction, and group counseling. The program has been nationally ranked for both affordability and quality; online students pay in-state tuition. ENSU hosts a variety of support services for online learners including a Student Help Desk, advising, and tutoring. City Vision is a fully-accredited university with the mission of providing “radically affordable Christian education.” The school is based in Kansas City, Missouri, and was established in 1998 by the Association of Gospel Rescue Missions. It offers web-based business administration, nonprofit management, technology ministry, and urban missions programs, along with an online substance abuse counseling degree. The bachelors in addiction studies was developed in collaboration with the NET Institute, a national center for addiction and recovery education. It takes students through the twelve core functions of substance abuse counselors, from screening to aftercare. Designed to prepare graduates for licensure exams, the 120-credit curriculum explores crisis intervention, group therapy, counseling skills, and issues related to addiction, like family dynamics and mental illness. Up to 90 credits can be transferred from accredited programs. City Vision claims its tuition is cheaper than 95 percent of nonprofit, private colleges. Ohio Christian, based in Circleville, Ohio, was founded shortly after World War II as Circleville Bible College with the goal of educating ministers for the Churches of Christ in Christian Union. It has grown since, adding degrees in business, government, human services, and psychology, and adding online programs. More than 500 students live on the school’s campus, and another 4,000 are enrolled at satellites in Ohio, Georgia, and online. Ohio Christian’s substance abuse counselor degree online is designed for adults and delivered with a Christian worldview. The BA in substance abuse counseling is a 120-credit program divided into three sections: general education (36 credits), electives (36 credits), and program requirements (48 credits). This includes courses like christian excellence and spiritual dimensions of illness and recovery. Classes are asynchronous, cohort-based, and offered sequentially. With a student-to-faculty ratio of 10:1, students are able to work closely with classmates and teachers. Students can earn credits through a prior learning assessment. The OCU Discovery Service allows online students to explore and access the library online. The school is accredited by the Higher Learning Commission. Course requirements for an online addiction counseling degree differ by school, but all programs provide students with training in behavioral theory, psychopathology, pharmacology, and the clinical applications needed to provide counseling services. This list provides examples of common undergraduate courses offered in substance abuse programs. This course provides students with foundational knowledge about the causes and treatment of addiction. Major themes include the stages, processes, and impact of addiction and substance use, and the role of the addiction counselor in prevention, intervention, and aftercare. The course also introduces future practitioners to the substance abuse counselors' code of ethics and legal issues affecting the profession. This course examines the neurochemical aspects of addiction and substance abuse with applications for clinical practice, diagnosis, and treatment. Students learn to recognize the effects of psychopharmaceutical chemicals, such as opiates and stimulants, on mood, sensation, cognition, and behavior. Students in this course learn about non-pharmacological process addictions, including compulsive behaviors such as gambling, video gaming, and sexual and eating disorders. Students study advanced counseling applications and best practices for screening, assessing, preventing, and treating these behavioral disorders. This course provides an overview of the professional responsibilities of counselors treating addiction and substance use disorders. The course covers ethical guidelines, legal standards, the Health Insurance Portability and Accountability Act, and the federal Privacy Rule. Students also study burnout and compassion fatigue prevention, the importance of professional supervision and consultation, and licensure and certification processes. Students study cultural competency principles and how cultural components impact the development and implementation of individualized counseling approaches and treatment plans. This course focuses on values and belief systems; socioeconomic characteristics; and differences in drug use, abuse, and treatment among diverse populations. How Long Does It Take to Get an Online Bachelor's in Substance Abuse Counseling? Most online bachelor's degrees in substance abuse counseling are earned in four years of full-time enrollment, although some schools offer accelerated programs that may be completed in 18-24 months. Most undergraduate programs require students to complete between 120-140 credits, including general education requirements, core courses in the major, and electives. Several factors determine the time to completion, including the program's graduation requirements and whether a student studies full time or part time. Internship or practicum requirements may extend the time to completion. Online learning formats also affect degree completion rates. Individually paced programs allow students to take courses at their own pace while cohort programs require students to study at the same pace as their peers. Prospective students should always consider accreditation status when comparing schools. Vocational, technical, and for-profit schools typically receive national accreditation. Four-year, degree-granting institutions commonly hold regional accreditation. National and regional accreditation indicate high academic standards and impact how employers, licensing boards, financial aid agencies, and graduate schools view the validity of a degree. Colleges and universities receive national or regional accreditation from independent regulatory accreditation agencies recognized by the U.S. Department of Education (ED) and the Council for Higher Education Accreditation (CHEA). The accreditation process considers many variables, including curriculum quality, faculty reputation, student services, and financial stability. Prospective students can find current directories of all accredited schools on the ED and CHEA websites. Programs within schools may acquire specialized accreditation, certifying high standards in curriculum, teaching, and research. The Council for Accreditation of Counseling and Related Educational Programs administers programmatic accreditation to graduate counseling programs. The American Psychological Association Commission on Accreditation awards specialized accreditation for master's and doctoral clinical psychology and counseling programs. Currently, no U.S. addiction counseling bachelor's programs hold programmatic accreditation. The career outlook for substance abuse and behavioral disorder counselors is promising. An industry profile by U.S. News & World Report noted that the unemployment rate for counselors in this field is 3.1%; the national unemployment rate is 3.9%. The BLS projects positions in substance abuse and behavioral disorder counseling to grow 23% through 2026, leading to roughly 60,300 new jobs nationwide. The growth rate is comparable to projections for other counseling fields. Using BLS data, the table below compares the industry outlook for four counseling professions. The BLS projects community and social service occupations, which includes counseling, to grow 14% through 2026. According to the BLS, substance abuse and behavioral disorder counselors earn a median annual income of $43,300 per year; this salary equates to an hourly wage of $20.82. However, the salary for an addiction counselor increases with experience. The next table features the average salary for substance abuse counselors at four career benchmarks. Substance abuse counselors increase their annual earnings by roughly 29% between the entry-level and late-career stages. PayScale also notes that average earnings for substance abuse counselors are on par with salaries for similar occupations, such as mental health counselors and licensed clinical counselors. Students with a bachelor's degree in substance abuse and behavioral disorder counseling and a state-issued license are qualified for a variety of jobs in counseling. Below, are four common positions for substance abuse counseling graduates. These counselors work with clients who are battling addiction at any stage. They often focus on psychological and emotional issues that trigger addictive behaviors. Substance abuse and behavioral disorder counselors may deliver therapy in one-on-one, couple, family, or group settings. Marriage and family therapists typically address the same mental health issues from a family perspective. These professionals typically specialize in cognitive therapy, which enables patients to understand destructive tendencies and replace them with more positive, goal-oriented habits and routines. This profession commonly requires a master's degree. These counselors work with all grade levels in public and private schools across the United States. Elementary school counselors generally focus on identifying behavioral problems, learning disorders, and other issues that negatively impact a student's growth and academic progress. In middle and high schools, counselors support students with emotional issues while providing guidance on college, employment, and other post-diploma pathways for high school graduates. This career requires master's degree. These counselors primarily offer services to patients with physical, mental, or emotional disabilities. They evaluate clients' abilities and help them secure employment, prepare for college, and perform other tasks associated with independent living. Rehabilitation counselors also maintain active client files to track progress and pinpoint areas for improvement. Many employers require a master's degree. Substance Abuse and Behavioral Disorder Counselors $43,300 23% Bachelor's degree For private practice, counselors must log 2,000-4,000 hours of supervised clinical training and pass a state-issued licensing exam. Annual continuing education courses are also required. Marriage and Family Therapists $48,790 23% Master's degree For private practice, counselors must log 2,000-4,000 hours of supervised post-degree training and pass a state-issued licensing exam. Annual continuing education courses are also required. School and Career Counselors $55,410 13% Master's degree For public school employment, counselors must receive state-issued certification. Some states also require one-two years of classroom experience and/or a teaching license. Rehabilitation Counselors $34,860 13% Master's degree Rehabilitation counselors must log 2,000-4,000 hours of supervised post-degree training and pass a state-issued licensing exam. Annual continuing education courses are also required. Professional organizations offer counseling students networking, career advancement, and learning opportunities. The following organizations host networking events, provide online trainings, maintain active job boards, and offer other services for students and graduates. This global organization represents roughly 85,000 counselors, educators, and other addiction personnel in the United States and internationally. Member benefits include discounts on professional development courses, journal subscriptions, and malpractice and liability insurance. Founded in 1952, the ACA is the world's largest professional organization for counselors, featuring more than 52,000 members. The ACA website contains information about licensure requirements, diagnostics, ethics, and other important aspects of the field. Continuing education opportunities, journal publications, and a job board are also available. The IAAOC represents addiction counselors and counselors in forensics and criminal justice. The association publishes a peer-reviewed online periodical: the Journal of Addictions & Offenders Counseling, and members are invited to participate in complementary webinar courses. Students enjoy a variety of financial aid opportunities to help pay for their degree. Students should submit the Free Application for Federal Student Aid (FAFSA) to learn about their eligibility for federal loans, grants, and work-study programs. Students should also explore grants and scholarships offered by nonprofit organizations, companies, and other sources. Approximately two-thirds of today's college students rely on loans to fund their education, but there are many other financing options you can use to reduce student debt. Learn about financial aid opportunities in this guide. Submitting the FAFSA determines your eligibility for federal financial aid. Our FAFSA guide features a breakdown of the application process and answers frequently asked questions. Use this guide to learn about the funding opportunities available to online students. This list features scholarships specifically for women. This list features scholarships, grants, and other financial aid options for single moms and dads. Today's psychology students are eligible for major-specific scholarships and grants offered by nonprofit organizations, higher learning institutions, and other financial aid providers. Learn about these opportunities in this guide. Millions of dollars in free money is available to U.S. military personnel. Learn more about grants, scholarships, and other financial aid opportunities for veterans, active-duty service members, and reservists in this guide. A master's degree is required for many professional counselors. Learn about degree and licensure requirements with this comprehensive guide. A master of social work degree is for students planning to pursue leadership roles in social work. Learn about this degree and review our list of the country's top 20 online MSW programs. A master's in psychology is a critical step for students planning a career in this field. Learn about this degree with our comprehensive guide. Our employment guide for counselors discusses educational and occupational requirements for substance abuse and behavioral disorder counselors, mental health counselors, and other counseling professionals. College students face pressures that can lead to depression, anxiety, substance abuse, and other mental health issues. Our comprehensive guide features strategies for identifying, addressing, and coping with mental health challenges as a student.